Whether your home bar is a perfunctory afterthought or a magnificent obsession, it can't reach its full potential without a well-selected handful of garnishes. Fresh items such as citrus fruit must be replaced on a regular basis, and they won't always be there when you need them. But brined or pickled staples such as cocktail olives are more obliging. 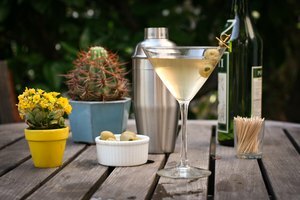 If you broaden your repertoire with a selection of olive-garnished drinks, you'll never be at a loss when unexpected guests arrive. 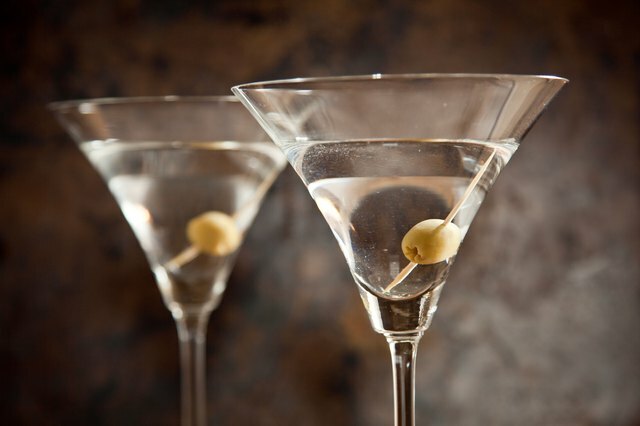 A classic martini is the grande dame of drinks to feature an olive garnish -- the most iconic of them all. The pungent olive provides an equally effective foil for the herbal, woodsy flavor of gin or clean, understated vodka, whichever you prefer. 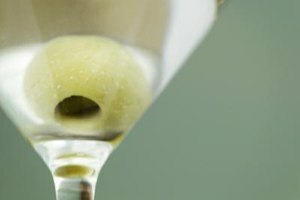 Replacing your bottle of vermouth regularly is the key to a good martini, because it will deteriorate in just a few months at room temperature. 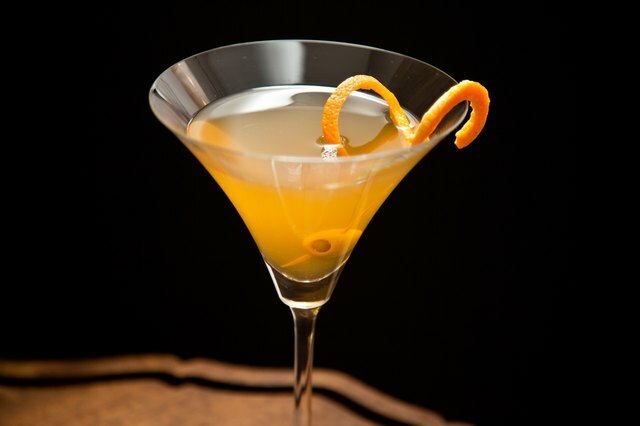 If a plain martini is too "same old, same old" for your liking, turn it into an Astoria by upping the vermouth and adding a splash of orange bitters. For an equally intriguing alternative, use half gin and half anise-flavored aquavit to make a Copenhagen cocktail. The sweeter, earthier, more complex flavor of whiskey lends itself to a number of olive-garnished beverages. 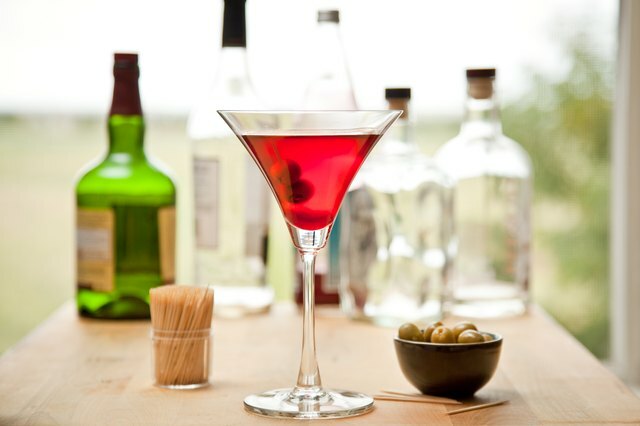 One of the most famous is the Manhattan, which simply replaces the gin or vodka with your favorite bourbon. If Scotch is your tipple of choice -- or more importantly, your guest's -- a similar substitution produces the Rob Roy. If you're up for something a little more festive, dig a bit more deeply into cocktail lore and whip up a highland fling. A fling replaces the dry vermouth with sweet, then adds a splash of orange bitters for contrast. 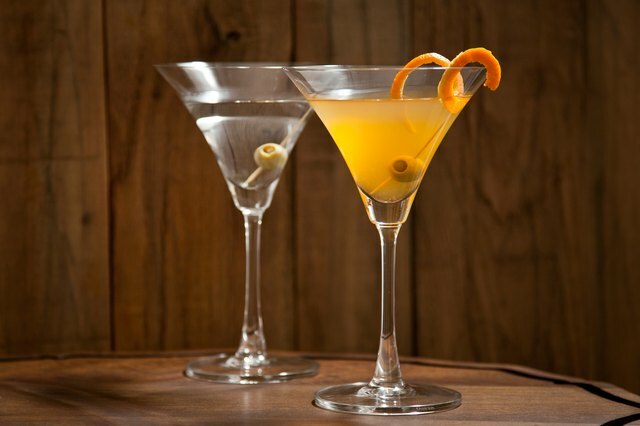 The Martini and its close kin have relatively clean, uncomplicated flavors, but they aren't the only game in town. For example, an eclipse is also based on gin, but it takes that basic flavor and runs with it. To prepare an eclipse, put your olive in the bottom of a cocktail glass and cover it with grenadine. Pour 1-part gin and 2-parts sweet, fruity sloe gin into your shaker; add a healthy splash of lemon juice to balance the sloe gin's sweetness. Strain the shaken drink into your glass, pouring it carefully to leave a visible layer of grenadine near the bottom. 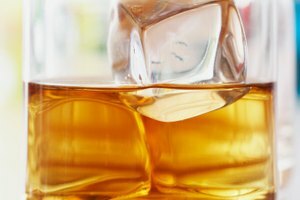 A good whiskey can also serve as the base for a more elaborate drink. Consider the example of the Blarney stone. You'll need 8-parts Irish whiskey, with 1-part each of anise-flavored pastis and fruity orange Curacao. Perfume your shaker with a dash of maraschino liqueur and one of orange bitters, and shake and strain it into your cocktail glass. Garnish with a strip of orange peel to bring up the fruit flavors, and an olive to provide them with a savory counterpoint. A few of these will unquestionably stimulate your storytelling prowess.